Cherry is the common name for various trees or shrubs comprising the subgenus Cerasus within the genus Prunus of the rose family Rosaceae, a genus that also includes almonds, peaches, plums, apricots and bird cherries. The term also refers to the fleshy fruit (drupe) of these plants, which contains a single stony seed, or to the wood of these plants. Cherry trees provide various ecologically, culinary, nutritional, commercial, and aesthetic values. They are integral to ecosystems, providing food for various animals, including birds, mammals, and caterpillars of various Lepidoptera. For people, various species provide popular and nutritious fruit for consumption, beautiful flowers and fruit of ornamental value, and wood for construction. The cherries selected for eating primarily are derived from two species, the wild cherry, P. avium, which has given rise to the sweet cherry to which most cherry cultivars belong, and the sour cherry (P. cerasus), used mainly for cooking and jam making. 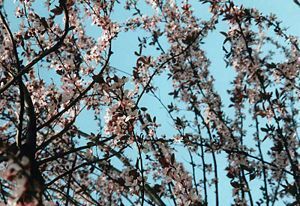 The black cherry, P. serotina, is used to provide wood for construction, and the Japanese cherry, Prunus serrulata, with its beautiful cherry blossoms, is a popular ornamental tree. Prunus is a genus of plant in the family Rosaceae. Rosaceae is one of the largest families of flowering plants with about 3,400 species, including apples, berries, peaches, plums, cherries, the hawthorn tree, the mountain ash, and many others. The genus Prunus includes the plums, cherries, peaches, apricots, and almonds. There are around 430 species of Prunus spread throughout the northern temperate regions of the globe. The flowers of Prunus species are usually white to pink, with five petals and five sepals. They are typically borne singly, or in umbels of two to six or more on racemes. The fruit of all Prunus species is a drupe with a relatively large "stone." Leaves are simple and usually lanceolate, unlobed, and toothed along the margin. The subgenus, Cerasus, is distinguished by having the flowers in small corymbs of several together (not singly, nor in racemes), and by having a smooth fruit with only a weak groove or none along one side. The subgenus is native to the temperate regions of the Northern Hemisphere, with two species in North America, three in Europe, and the remainder in Asia. The "bird cherries" are generally considered another subgenus, Padus, within the genus Prunus. The type species is the bird cherry, Prunus padus, which sometimes is known as Cerasus padus. The bird cherries are native throughout the temperate Northern Hemisphere and are characterized by having deciduous leaves, flowers 12-30 together on slender racemes produced in late spring well after leaf emergence, and small, sour fruit usually only palatable to birds, hence the name. The word "cherry" comes from the French word "cerise," which comes in turn from the Latin words cerasum and Cerasus. There are about 150 species of cherries (Dzhangaliev et al. 2002). The two most important species in terms of fruit production are the sweet cherry (Prunus avium) and the sour cherry (Prunus cerasus). They are said to be of ancient origin, perhaps coming from Armenia or near the Black Sea and Caspian Sea (Rhind 1865). 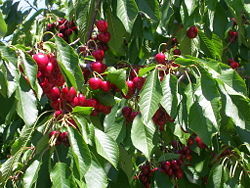 Herbst (2001) states that the name cherry came from Cerasus, a Turkish town. The main cherry for eating are cultivars of the sweet cherry, P. avium. The sweet cherry was derived from the wild cherry, P. avium. The stones of wild cherries have been found in deposits at bronze age settlements throughout Europe, including in Britain (Huxley 1992). By 800 B.C.E., cherries were being deliberately cultivated in Turkey, and soon after in Greece (Huxley 1992). The sweet cherry have firm, heart-shaped fruit that are good for eating out of hand or cooked (Herbst 2001). The Sour Cherry (P. cerasus) is closely related to the wild cherry, P. avium, but has a fruit which is more acidic, and so is useful primarily for cooking and jam making. The tree is smaller than the wild cherry, growing up to 4-10 m tall, and has twiggy branches, while the crimson to black fruit is borne on shorter stalks. The fruit tends to be smaller, softer, and more globular than the sweet cherry varieties (Herbst 2001). The sour cherry also has an ancient origin in human culture. Cultivated sour cherries were selected from wild specimens of Prunus cerasus and the doubtfully distinct P. acida from around the Caspian and Black Seas, and were known to the Greeks in 300 B.C.E. They were also extremely popular with Persians and the Romans who introduced them into Britain long before the 1st century AD. In Britain, their cultivation was popularized in the sixteenthth century by Henry VIII. They became a popular crop among Kentish growers, and by 1640 over two dozen named cultivars were recorded. In the Americas, Massachusetts colonists planted the first sour cherry, 'Kentish Red', when they arrived. The other species, although having edible fruit, are not grown extensively for consumption, except in northern regions where the two main species will not grow. Some, such as the black cherry, are very popular for making fine furniture and others, such as the Japanese cherry, are popular ornamental trees. Given the high costs of production, from irrigation, sprays, and labor costs, in addition to their proneness to damage from rain and hail, the cherry is a relatively expensive fruit. Nonetheless, there is high demand for the fruit. Cherries have a very short fruiting season. In Australia, they are usually at their peak around Christmas time, in southern Europe in June, in America in June, and in the United Kingdom in mid July, always in the summer season. Annual world production (as of 2003) of domesticated cherries is about 3 million metric tons, of which a third are sour cherries. In many parts of North America, they are among the first tree fruits to ripen; hence the colloquial term "cherry" to mean "new" or "the first," e.g. "in cherry condition." Major commercial cherry orchards in Europe extend from the Iberian peninsula east to Asia Minor; they are also grown to a smaller extent north of the British Isles and southern Scandinavia. In the United States, most sweet cherries for fresh use are grown in California and Washington. Most sour (also called tart) cherries are grown in four states bordering the Great Lakes, in Michigan (the largest producers of cherries among the states), New York, Pennsylvania, and Wisconsin. However, native and non-native cherries grow well in Canada (Ontario, and British Columbia) as well. Important sweet cherry cultivars include Bing, Brooks, Tulare, King, Lambert, and Rainier. Oregon and Michigan provide light-colored Royal Ann (Napoleon; alternately Queen Anne) cherries for the maraschino cherry process. Cultivars of sour cherries include Nanking, Richmond, Montmorency, Morello, and Evans Cherry. Ecologically, cherry trees provide food for various animals, including the caterpillars of several Lepidoptera. The fruit are readily eaten by numerous birds and mammals, which digest the fruit flesh and disperse the seeds in their droppings. Some rodents, and a few birds (notably the Hawfinch), also crack open the stones to eat the kernel inside. For people, the sweet and sour cherries are very popular fruits. The sweet cherry is both eaten fresh and cooked in various desserts, or added to various dishes, such as ice cream. The sour cherry, because most are too tart to eat raw, are used to make pies, preserves, and similar dishes (Herbst 2001). Other species are also used for making pies and so forth. Cherries have been shown to have several health benefits. Cherries are a source of vitamin C and dietary fiber. Cherries also contain anthocyanins, which is the red pigment in berries. Cherry anthocyanins have been shown to reduce pain and inflammation (Tall et al. 2004). Anthocyanins are also potent antioxidants. Cherries also have been shown to contain high levels of melatonin (Burkhardt et al. 2001), with some research indicating low melatonin levels to be correlated with heart attacks. Besides being an antioxidant, melatonin has also been shown to be important for the function of the immune system. Research also indicates that melatonin suppresses COX-2. There is considerable interest at present in the use of fresh cherries or cherry juice to treat gout. As well as the fruit, cherries also have attractive flowers, and they are commonly planted for their flower display in spring. Several of the Asian cherries are particularly noted for their flower display. The Japanese sakura in particular are a national symbol celebrated in the yearly Hanami festival. 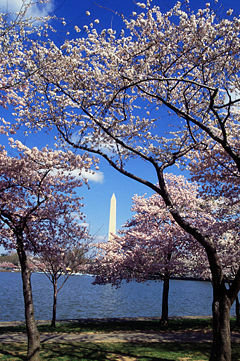 In Washington, D.C., the cherry blossoms in the spring are a major tourist attraction, with the trees originally presented to the nation's capital in 1912 by the governor of Tokyo (Herbst 2001). Many flowering cherry cultivars (known as "ornamental cherries") have the stamens and pistils replaced by additional petals ("double" flowers), so are sterile and do not bear fruit. They are grown purely for their flowers and decorative value. The most common of these sterile cherries is the cultivar 'Kanzan'. Cherry also is popular wood for constructing cabinets, flooring, and furniture. The black cherry offers a strong reddish color. Burkhardt, S., D. X. Tan, L. C. Manchester, R. Hardeland, and R. J. Reiter. 2001. Detection and quantification of the antioxidant melatonin in Montmorency and Balaton tart cherries (Prunus cerasus) J. Agric. Food Chem. 49(10): 4898-4902. Retrieved September 3, 2007. Dzhangaliev, A. D., T. N. Salova, and P. M. Turekhanova. 2002. The wild fruit and nut plants of Kazakhstan. Kazakhstan Academy of Science. Retrieved September 3, 2007. Huxley, A., ed. 1992. New RHS Dictionary of Gardening. Macmillan. ISBN 0333474945. Rhind, W. 1865. A History of the Vegetable Kingdom. Tall, J. M., N. P. Seeram, C. Zhao, M. G. Nair, R. A. Meyer, and S. N. Raja. 2004. Tart cherry anthocyanins suppress inflammation-induced pain behavior in rat. ''Behav. Brain Res. 153(1): 181-188. Retrieved September 3, 2007. This page was last modified on 7 November 2011, at 14:37.